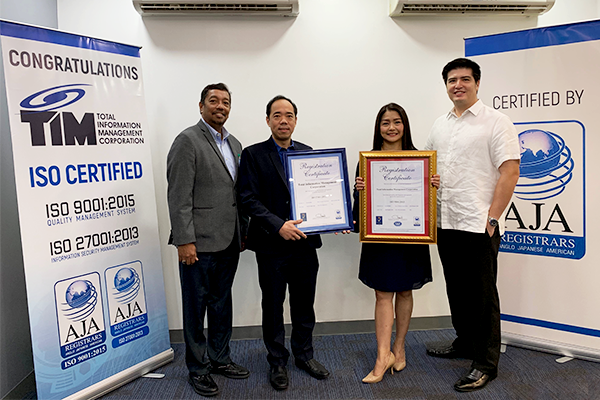 Total Information Management Corporation continuously proves its efforts in offering world-class service as it officially receives its certificates for ISO 9001:2015 Quality Management System and ISO 27001:2013 Information Security Management System. 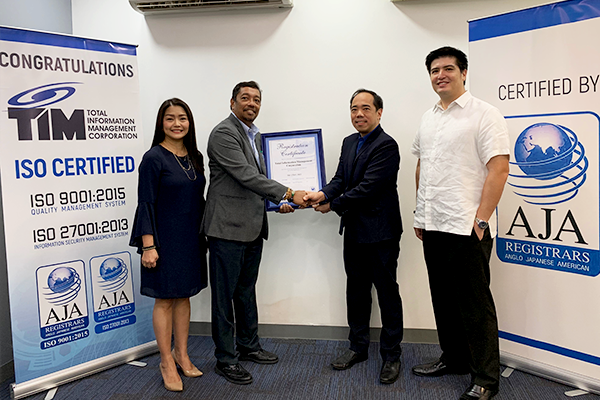 The awarding ceremony was held at the TIM head office on December 18, 2018 officiated by Mr. Paul B. Bagatsing, Vice President of the Anglo-Japanese American (AJA) Registrars, Inc. These certifications guarantee TIM’s compliance to ISO requirements in ensuring quality and consistent systems not only in administrative processes, documentation and service enhancements, but also in information security management as well. Additionally, these demonstrate how TIM upholds its commitment in fostering continuous improvement within its management systems so as to offer quality products and services to the fullest satisfaction of its customers. 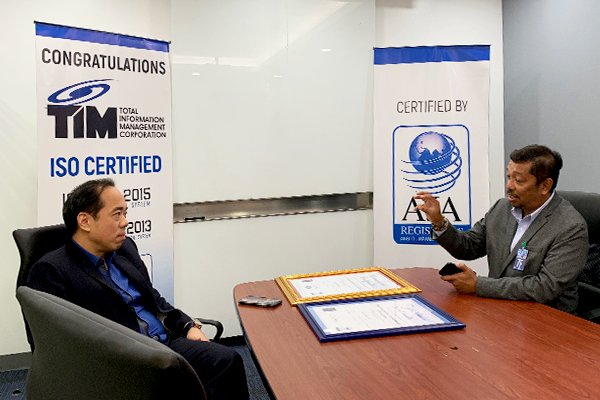 ISO 9001:2015 was officially awarded to TIM on October 22, 2018 and is the latest version of Quality Management System which provides a framework for monitoring and measuring process performance and operations to ensure increased efficiency and improved customer satisfaction. 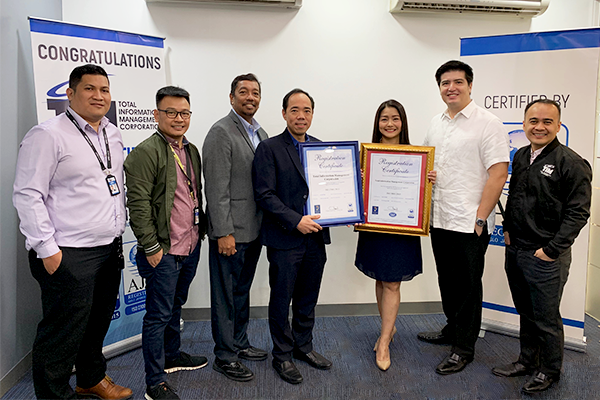 Meanwhile, ISO 27001:2013 was officially granted to TIM on November 15, 2018 and is the current industry standard for the implementation, maintenance, and continuous improvement of information security management system. It minimizes risks of data breach through a systematic approach that includes manpower enablement, streamlined processes, and enhanced IT systems. Significantly, ISO’s goal goes hand in hand with TIM’s mission—catalyzing innovation and providing solutions to global challenges. With TIM now equipped with the latest industry standards in quality service and information security, implementing these high standards guarantee that this resilient IT company serves with the best people and systems in bridging its customers to success.